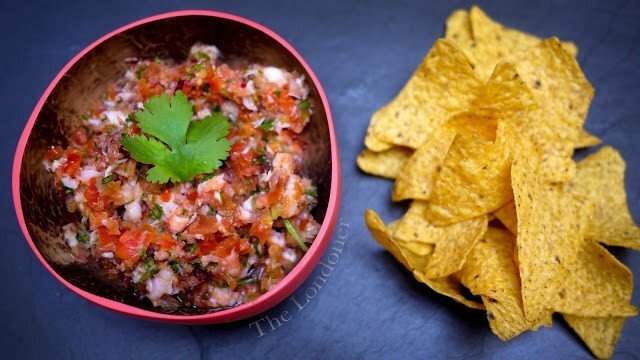 This is one of my all time favourite dips. Whenever the girls come over for a movie session it’s first on their list of requests (the second is anything featuring Ryan Gosling, but come on… he is a dream boat). It’s jam packed with flavour, but only has around 100 calories per serving. I serve mine with salted tortilla chips, margaritas & frosty Corona beers. Chop the hell out of all your ingredients & sling ’em in a bowl! I know, I know, nothing this easy can possibly taste good, right? The combination of these punchy, fresh, flavour filled ingredients (in just the right amounts) will blow your mind, trust me. Great for a drinks party, nibbles before dinner or just a night in with a movie. If you’re feeling particularly jazzy, serve your dip in half a painted coconut shell like I did. as you wiggle your way to your guests. Spring break all year round! , chop up an avocado & stir it in too. It’ll make it a bit creamier & it’sÂ ridiculouslyÂ good for you.